Meat Racket excerpt: How the Grain Inspection Packers and Stockyard Administration overhaul failed. The president’s ambitious antitrust plan was no match for lobbyists with lots of cash. This essay is excerpted from The Meat Racket: The Secret Takeover of America’s Food Business, by Christopher Leonard, published by Simon & Schuster. Read another excerpt from The Meat Racket, about how Tyson keeps chicken prices high. On a chilly morning in March 2010, U.S. Secretary of Agriculture Tom Vilsack addressed a crowd of nearly 1,000 politicians, farmers, lobbyists, and journalists in Ankeny, Iowa, a nondescript little suburb of Des Moines. The purpose of the public hearing was to examine the growing power of agribusiness corporations like Tyson Foods. “Let me start off by saying how deeply concerned I am about rural America,” Vilsack said. He questioned whether the top-heavy food industry was rigged against the very farmers who actually produced the food. Then he outlined a governing agenda that was characteristically ambitious for the Obama administration in its early years. It wasn’t enough to simply fix these problems by enforcing existing rules and regulations, Vilsack suggested. “The president has instructed the Department of Agriculture to establish a framework for a new rural economy,” Vilsack said. For those in the crowd, from the farmers to the lawyers, bankers, and politicians, the prospect for fundamental reform was tangible. There could be a new framework. A new system of power in rural America. What no one in the giant auditorium could foresee that day was that Obama’s effort would ultimately be a spectacular failure. The story of how Obama failed shows how the administration quickly backed down when corporate interests put up a fight, and how political operatives muzzled and undermined the very reformers Obama’s team installed after his election. It is a pattern that has played itself out in failed efforts to reign in the nation’s biggest banks or stop consolidation in the airlines industry, to take just two examples. The failed attempt to rein in the big meat packers’ power also illustrates the remarkable level of influence that giant meat companies have in Washington, where they quietly shape public policy to their advantage through groups like the American Meat Institute and the National Chicken Council. Their well-orchestrated effort to beat back Obama’s reform efforts has arguably left them more powerful than they were when Obama entered office. And like many of the changes in America’s meat industry, it all played out under the public’s radar. In the months leading up to the hearing in Ankeny Tom Vilsack installed a team of regulators who would overhaul the Grain Inspection Packers and Stockyards Administration, an agency with special antitrust authority over meat companies. The obscure GIPSA agency played a critical role in protecting America’s meat supply. The agency’s authority derived from laws passed 100 years ago to combat the abuses of a so-called “Meat Trust,” a small group of old-school meat packers like Armour and Swift. The Meat Trust underpaid farmers and hiked prices for consumers, and the USDA was remarkably effective at breaking up the meat companies’ monopolistic power. By 1982, the four biggest beef companies controlled only 44 percent of the market and the four chicken producers controlled only 32 percent of the market. But lax enforcement during the 1980s and 1990s brought consolidation back to meat production. For several months during 2010, the policy makers inside GIPSA drafted a new rule that would carry out the changes that could rebalance the scales of power in rural America. For example, the rule would ban a chicken farmer payment scheme that is known throughout rural America simply as the “tournament.” Under the tournament, chicken farmers do not get paid for how much food they raise. Instead, poultry companies like Tyson pay the farmers based on a ranking system that compares each farmer’s performance against his neighbor’s. The winners are rewarded while the losers are paid so little that many go out of business. Farmers have no control over the main criteria for their success in the tournament—the health of the chickens and the quality of the feed that Tyson provides them. This makes the tournament more like a lottery. The new GIPSA rule would have effectively banned the tournament by guaranteeing farmers a predictable base payment and allowing companies like Tyson to only offer incentives for good performance, in other words, rather than docking a farmer’s income by adjusting the base pay rate through the tournament. The rule also made one legal change that aimed to make GIPSA more powerful than ever by strengthening the Packers and Stockyards Act, which was passed in 1921. The new rule would let farmers or ranchers sue a company like Tyson under the Packers and Stockyards Act if the farmer could prove Tyson had harmed the farmer’s business. Thanks to a series of court decisions, farmers must currently prove that meat companies not only hurt the farmers’ business with their actions, but the state of competition in the entire meat industry. That bar has proven almost impossible to reach, rendering the Packers and Stockyards Act toothless. The proposed GIPSA rule was released in June 2010. Inside the American Meat Institute, there was shock the day the GIPSA rule was proposed. Mark Dopp, the lobbying group’s director of regulatory affairs, didn’t mince words about his opinion of it. What seemed most disturbing to the American Meat Institute (and its partner groups like the National Chicken Council and National Cattlemen’s Beef Association), was the provision that lowered the bar to bringing lawsuits under the Packers and Stockyards Act. The meat lobbying groups began to gather their wits after the initial shock of the seeing the new rule. The groups would follow their tried-and-true playbook, and respond in unison. By releasing the GIPSA rule, Vilsack kicked into motion one of the better-funded, better-coordinating lobbying machines in Washington. The meat companies themselves had tremendous resources at their disposal. The biggest meat companies—Tyson Foods, Conagra Foods, Cargill, Smithfield and JBS—spent a combined $5.94 million on lobbying during 2010 alone, according to an analysis of disclosure reports. Tyson had the biggest lobbying operation by far, spending $2.59 million. The companies were joined by the American Meat Institute, the National Chicken Council, the National Cattlemen’s Beef Association and the National Pork Producers Council, which together spent $1.85 million on lobbying during 2010. Together, the trade groups and companies spent $7.79 million on lobbying in 2010. Influencing GIPSA directly wasn’t going to be an option, and the White House had publicly cast its lot behind stronger enforcement. So the meat lobby turned to the governing body it knew could yield the best results: Congress. During an Agriculture Subcommittee hearing in July, the meat lobby’s allies in Congress attacked the proposed antitrust rule as toxic government overreach. Both Democrats and Republicans alike lit into USDA official Edward Avalos who had been propped up to defend the rule. Avalos stuttered and looked nervous, like a bank teller caught with his hand in the till. David Scott, a Democrat from Georgia who chaired the subcommittee, was almost poetic in his anger as he stared down at Avalos. “Mr. Undersecretary, I think what you have witnessed with this committee today is a very passionate outpouring of very serious concern that the Agriculture Department, in proposing this new rule, has very seriously—seriously—overstepped their boundaries … It is what Shakespeare referred to when he said, ‘Et tu, Brutus, yours was the meanest cut of all,’ ” Scott intoned. To appease his critics, Vilsack extended the public comment period for the new rule, and said that the USDA would conduct an economic study assessing the rule’s impact on rural America. The study would take more than a year to complete. The extra time for comments and studies was a victory for the meat lobby. As the rule was delayed, it opened the door for a different narrative about the rules to emerge, and for opposition to grow. To shape the debate, meat company lobbyists used an increasingly common tactic in the Washington influence industry. They stoked a “grassroots” movement of ordinary people who contacted lawmakers to voice complaints and make suggestions that perfectly mirror the wishes of big business. In the meat business, of course, there was no more effective group to enlist for such an effort than farmers themselves. If farmers opposed USDA’s efforts, it was hard to justify them. On Aug. 4, 2010, the National Chicken Council sent out a confidential memo to poultry companies like Tyson Foods and Pilgrim’s Pride. The memo urged the companies to contact their farmers and ask them to oppose the GIPSA rule by sending comments to the agency. The memo, which was later leaked to the Agri-Pulse industry news service, focused specifically on the provision that would ban the modern tournament system. On Oct. 21, GIPSA got an angry letter from Eunice Richardson, an elderly chicken farmer. Richardson raised birds for a small company called Wayne Poultry in Danville, Ark. Richardson said she opposed the new rule, and her letter used language borrowed directly from the memo lobbyist Richard Lobb sent the poultry companies in August of that year. Richardson said she sent the letter to GIPSA after “they” provided her a copy of the letter to sign. Richardson declined to say who “they” were. She said she didn’t want to do anything that might get Wayne Poultry in trouble. Even though she signed the letter at someone else’s urging, Richardson said she truly believed the GIPSA rule was a horrible idea. She thought it would remove the incentive for farmers to work hard. Besides, a new rule wouldn’t help her anyway. Richardson declared bankruptcy and lost her farm about a year after she sent the letter. It had gotten harder over the years to pay the bills on her poultry farm. The utility costs kept rising, and her pay didn’t keep up. The final straw came in 2011 when one of her power generators broke down, and she couldn’t afford to pay for repairs. After more than a decade in the poultry business, she declared bankruptcy. But Richardson didn’t complain. At age 80, she collected Social Security. And she said she loved the Wayne Poultry employees like her own grandkids. The company always treated her fairly, she said. During the course of 2011, the meat industry’s intensified opposition to the new rule began to foster deep divisions inside Secretary Vilsack’s department of agriculture. This pressure fractured Vilsack’s team into two camps: the pragmatists and the reformers. To the pragmatists, the new rule was starting to look like a disaster. It was the worst of all worlds, in legislative terms. By tackling too many problems in the meat industry, it united the opposition of pork, chicken, and beef companies. The pragmatists wanted to scale back the rule, and ultimately they won out. Vilsack’s team decided to delay enacting the GIPSA rule’s most sweeping reform: the provision that would have made it easier to sue meat companies for unfair or deceptive practices. The USDA would re-propose the provision rather than pass it as a final regulation, giving the industry more time to comment on it and request changes. The agency also decided to delay enacting its reform of the tournament system for poultry payments, changing the measure to an “interim” rule that would be enforced for just 60 days. In Congress, meanwhile, the meat industry’s big spending was paying off. The House of Representatives passed a spending bill that summer that banned GIPSA from using any money to finalize its new antitrust rule. In essence, the “defunding” provision meant that USDA couldn’t enforce the GIPSA rule even if it was finalized. It was a classic case of Congress using its power of the purse to influence policy in the executive branch. In November, members of the House and Senate met in a closed-door session to iron out their different spending bills into a comprise measure. Inside that conference committee, the GIPSA rule was killed. Congress stripped funding for the GIPSA rule on a remarkably detailed level. The spending bill went through the proposed rule, naming specific paragraphs and provisions, barring USDA from spending any money to enforce them. After the bill was released, meat industry lobbyists gave a special public thanks to the senators who helped them. Between the Obama administration’s own back-pedaling and Congress’ opposition, the GIPSA rule was dead. A final version of the rule was released in December. It enacted one reform, one that allowed poultry farmers the right to sue meat companies in court if they had a contract dispute (most contracts had previously forced farmers into private arbitration hearings to settle disputes, keeping them away from unpredictable juries). The final rules also contained new guidelines suggesting when a poultry company could cut off of farmer or require a farmer to invest more money in their chicken houses. Those guidelines did not have the binding power of new rules, Vilsack admitted, but he hinted that the new guidelines would act as a deterrent for poultry companies. 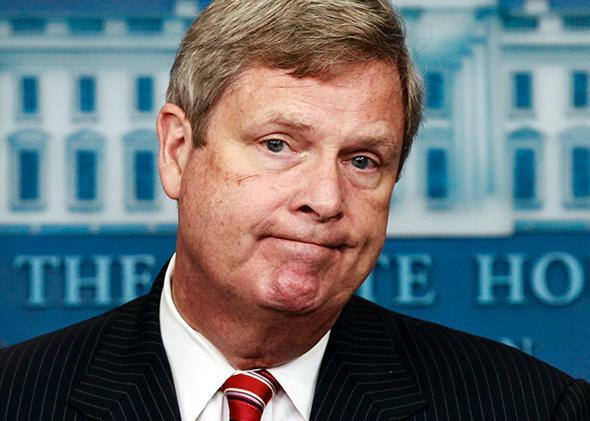 A full year-and-a-half after Tom Vilsack promised “a new rural economy,” neither the Department of Agriculture nor the Department of Justice had issued any new policy recommendations. No major antitrust cases were filed. No joint report was issued. The meat industry’s massive investment in lobbying was well worth the investment. Since Obama has taken office, the nation’s four biggest meat companies have steadily hiked prices and widened their profit margins. Last year alone, Tyson Foods reported a record profit of $778 million as the company raised prices for chicken, pork and beef. And in rural America, companies like Tyson are conducting business as they always have, using the tournament system to make chicken farmers compete against one another. The only difference is that now, the big meat companies have proved that Washington is incapable of doing anything about it.